I have been having so much fun experimenting with new sourdough recipes, that I forgot to post the one for the biscuits that I promised! These biscuits are a great way to use starter that you might be discarding when it is sourdough feeding time. Of course, you don’t have to be throwing out starter to make these, you could just make them because you want to! I have made different variations of these: cinnamon raisin and cheddar garlic, and they are really good. Course, the plain ones are really good, too. But I just can’t seem to not experiment with recipes! I’ll probably have to experiment with chocolate chips next. Because you know as well as I do that anything good is going to be better with chocolate! In a large bowl, combine flour, baking powder, salt, and baking soda. Cut in butter until mixture resembles course crumbs. Add sourdough starter and buttermilk to the flour mixture; stir with a fork until the dough forms a ball. You may need to adjust the flour or milk depending on how thin your starter is. Turn dough onto a well floured surface; knead 5-10 times. Roll or pat out to 1/2 inch thickness. Cut with a floured biscuit cutter. Place 2 inches apart on a buttered baking sheet. Brush with melted butter. Bake at 425 degrees for 12-15 minutes or until golden brown. Serve warm with more butter and the jam or jelly of your choice! Yield is 1 dozen with a 2 1/2 inch biscuit cutter. 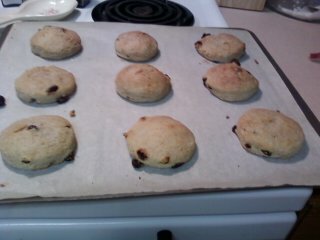 I used the cinnamon raisin biscuits for this experiment. The ones on the far right of the pan I let thaw for 30 minutes, the ones in the middle thawed for 10 minutes, and the ones on the left I put straight into the oven. There did not seem to be much of a difference in the way they turned out. So, if you are going to be freezing them, you can just cook them straight out of the freezer. I have to say though, that after freezing they did not rise as high as the ones that I didn’t freeze. The moral of the story is: fresh is better if you have the time! And, really, it doesn’t take more than 10 minutes to mix, pat, and cut out the biscuits. If you pre-heat the oven at the same time, you can have fresh, yummy biscuits in 25 minutes start to finish. I usually scramble the eggs and fix the bacon while the biscuits are cooking. 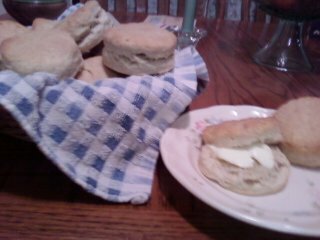 Or sometimes we just have biscuits and jelly for supper, in which case I make a double batch. My kids love having breakfast for supper and so do I. I wonder what that says about us…? I saw a recipe for ham and cheese biscuits the other day, so I will probably try those out soon. What kinds of additions do you like in your biscuits?